To understand why I say this game isn’t that much of an RPG, I think you need to understand the gameplay mechanics. You explore a level. Each level has a shop. Some levels are dark, and thus need you to have candles so you can identify monster names and have more clear colors for the levels. When you get to the end of the level, the last two or three enemy groups will start dropping keys. Get a key, and you can open the door to fight a boss. Then you pick the left or right passage, and you continue. 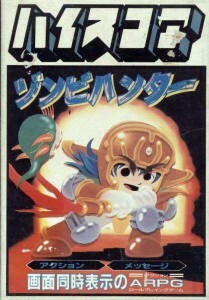 The MSX port of Zombie Hunter looks similar to the NES one. In the easy mode of the game, the drops are fixed. In the hard mode, they are randomized. You always get food, say, from this type of group if they drop an item. You always know that near the end of a level you can find a key. Unfortunately, enemies don’t always drop items. You may just get gold from an enemy. This means that you may get stuck grinding for food to heal, or grinding for weapons so you can fight, or grinding for a key. Shops don’t necessarily sell useful stuff. The very start of the NES version of Zombie Hunter. So, if you cheat your health to be reasonable and a sensible weapon, is the game fun? It is interesting to explore, but it still feels very clunky and early. You can have a bright level and have way too many candles, and a dark level where nothing drops anything useful. Bosses are repeated in several stages. The depth of the game is amazing for the era, but it’s really not fun from a modern standpoint. Preparing to equip some armor in Zombie Hunter. If you could get items more easily, it wouldn’t be so annoying. 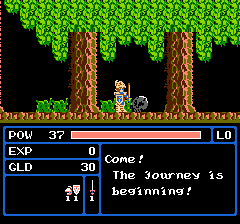 Since your armor and weapons can wear out, you can literally be in the final stage of the game and be only able to make 1 HP damage on enemies. The plot is paper thin, and the gameplay mostly amounts to walking to the right. If you fall in a pit, you get a room with some enemies, and then you’re allowed to continue. This is a nice feature, but it adds to the grindy elements of the game. Money is basically useless since a shop isn’t guaranteed to have what you need, and they are slightly hidden. Levelling purely allows you to advance in the game, since the damage outputs of the enemies means that you can get killed if you don’t level. 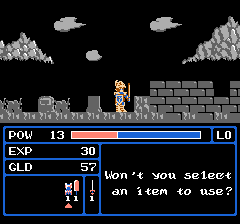 While items are available, you can literally finish most of the game with a good weapon and grinding for food to heal. All in all the game is good for a 1987 game. You have smooth screen scrolling. You have an action battle system that allows fleeing enemies and you to flee. You have a large sword swing, so fighting isn’t that bad. Jumping is awkward, but pretty controllable. The main problem with the game is that the difficulty level is mostly based around patience and the randomizer being kind. You don’t get the RPG exploration feeling, since you’re going right. You don’t get RPG equipment upgrades since it’s mostly randomized what you find, and better equipment isn’t obviously better. You do get RPG style new enviroments and bosses, but the lack of other elements makes the game feel a lot more like an action game.